Wedding invitations are a key part of the big day. So much more than providing the details of the special day, the invitation is the first glimpse your guests have of your wedding – the style, tone, formality. At Flaire Celebrations, we understand that and our designers want to help you choose the perfect invitation to match your personality and style. 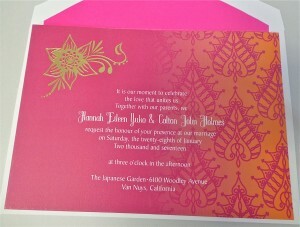 Traditional, modern, formal, rustic, glamorous – your style, your special day, your unique, customized invitation. * Save-the-date cards are sent out six to eight months prior to the wedding. * Invitations go out six to eight weeks before the wedding. If it is a destination wedding, give your guests more time by sending out the invites three months ahead of time. 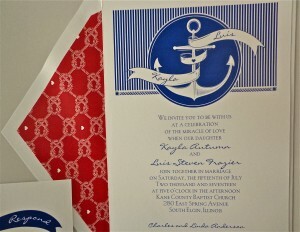 * Your invitation can be a valuable tool in alerting guests to “dress code.” An ultra-formal letterpress invite with calligraphy sets a different tone than a brightly colored, uniquely shaped invite with a whimsical font. It is also acceptable to include “black-tie” or “casual attire” in the lower right or left-hand corner. * If your ceremony and reception are for adults-only, address your invitations to each guest by name; this should alert the recipient that it is not okay to include “extra” guests. * It is perfectly acceptable to invite guests solo; you do not need to include “plus-one’s” if you choose not to. * Although frequently done, the invitation is not the place to include your registry info; it implies you are asking for gifts.